If you've been following this blog for a while, you probably noticed that there was a poll for which pen I should review next in the sidebar. The Montblanc 146 won, and I did intend to review it next; but I decided to send it off for nib work to give it a better review. I've already taken and edited pictures, so the review should be up soon after it comes back from Pendleton Brown. 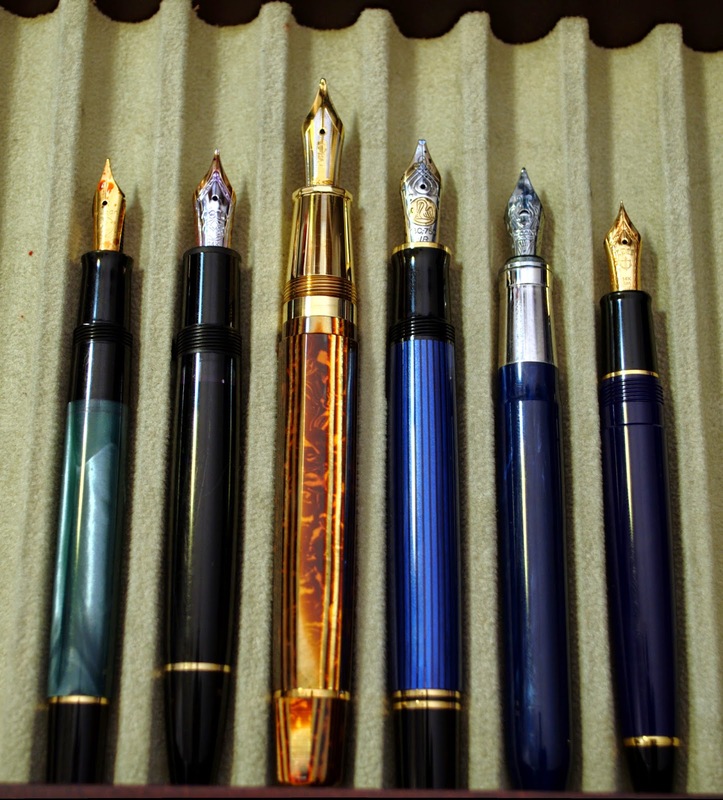 Where to buy: Classic Fountain Pens, Fahrney's Pens, and La Couronne du Comte all have this pen for $800-$956, but I would recommend instead buying a lightly used one from eBay as they're much cheaper. Since first seeing OMAS's Arco celluloid a while ago, I've wanted a pen made from it. Some models, like the Ogiva, caught my eye; but the seemingly terrible quality control on those prevented me from pulling the trigger. Enter the new-style Paragon. This one has a metal piston instead of a plastic one like the Ogiva's, so complaints about it are nearly non-existent. It's also huge - bigger than even the purported king of pens, the Montblanc 149. But one thing prevented me from getting this seemingly ideal pen: the price. With a street price of nearly $1000, there was no way I could rationalize purchasing one. Even a 90th Anniversary 149 is cheaper than that. One day I was browsing eBay looking at old-style, less expensive Paragons when a listing caught my eye. A new Arco Paragon, only dipped, was selling for less than half the usual price! Naturally, I purchased it a few minutes later even though I was eating lunch at the time. 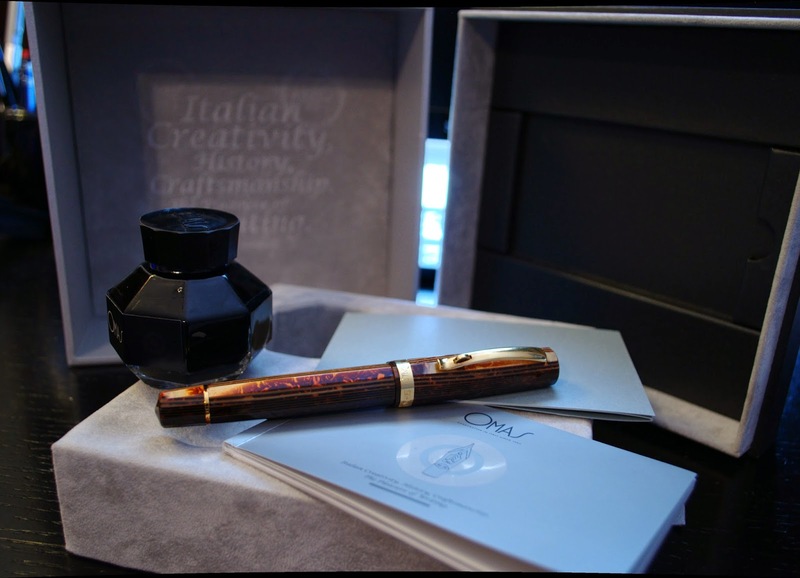 Packaging is the first part of the new pen experience, and OMAS certainly doesn't disappoint here. The box is large and sets the stage for the pen you're about to see. The top lifts off, and on the inside is a fairly nice calligraphic design. 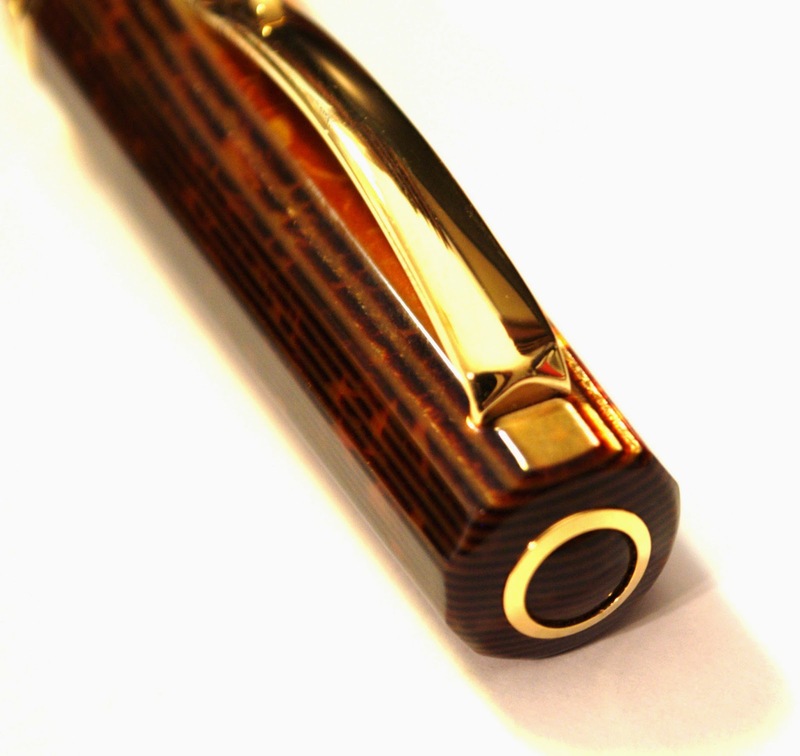 The pen itself is within a cloth carrying case which also serves to polish it. A bottle of ink is also included, in this case, blue; but I've seen other colors included to match the pen. You can then remove that insert holding the pen and ink to find a booklet explaining the history of OMAS and another for ... the Omas 360 Vintage edition of course. I suspect that, given the blue ink and 360 booklet, this probably wasn't the pen's original box; but that doesn't bother me as it's not really important. Despite what some (cough, Richard Binder, cough) may say about the new Paragon's design, I really like it. For those who haven't looked much into OMAS, in 2005 they redesigned several of their models to meet what they thought consumers wanted. Instead of having the desired positive effect, that mostly backfired. (Just look at the new 360 compared to the old one.) In contrast to the downsizing of the 360, the Paragon was drastically increased in size to better compete with the Montblanc 149. I personally prefer this new upscaled Paragon as it feels much nicer in my hand than the old one. The dodecagonal faceted shape is beautiful, but the real reason I bought this pen is the stunning Arco Gold (or Bronze) celluloid. There's a depth to it not found in many other materials: certain parts seem to glow; whereas, others are almost black. It really is the most beautiful pen material out there; in my eyes, it even beats out Tibaldi Impero celluloid. The writing end of this pen also manages to look simply stunning. The section is made of sterling silver and plated with gold. Some complain that metal sections are too slippery for extended use, but I don't have any issues with this one. 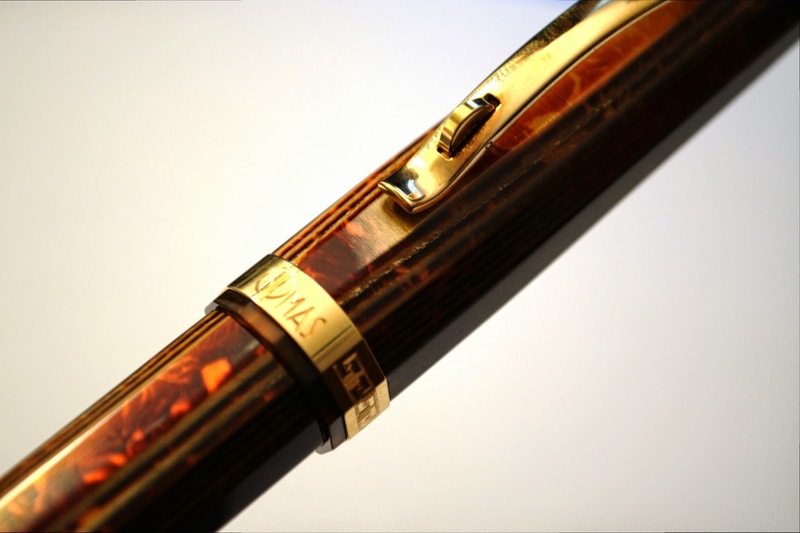 The large, two-tone nib is 18kt gold and available in EF-BB, but not the full range available on some of OMAS's other pens. It's a bit saddening that there won't ever be an Extra Flessibile Paragon, but that doesn't keep me up at night. The cap's lip is oddly translucent. Another design aspect which I didn't quite like at first was the large gold "O" on the cap's finial. It seemed fairly gaudy; but, as with the Montblanc snowflake, it's beginning to grow on me. As previously mentioned, this is a big pen. It fits right in with oversized pens like the M1000 or Montblanc 149 and easily dwarfs others such as the M200 and Sailor 1911 Mid-Size. This pen can post but becomes 7-inches long when you do, so I prefer writing with it unposted. At 48 grams capped and 35 grams uncapped, this pen certainly isn't light either. It's oversized, and I like that; but some users may find it too big and heavy for extend periods of writing. 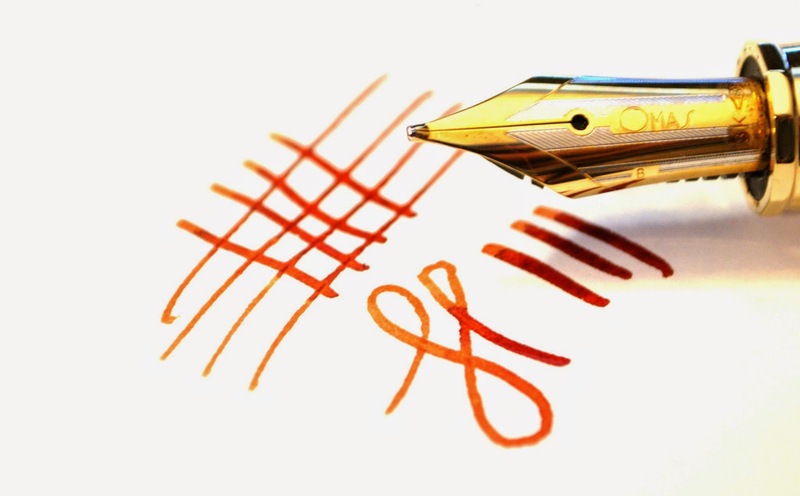 To give some perspective, Classic Fountain Pens has a chart which lists the measurements of many other pens and allows you to compare them easily. Click to enlarge the photographs. 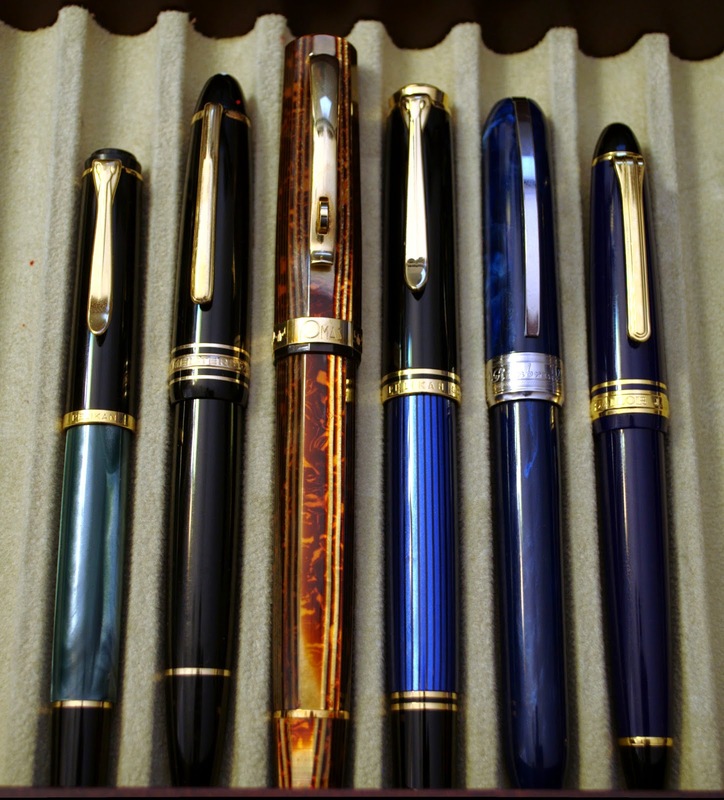 From left to right, the pens are a Pelikan M200, a Montblanc 146, an Omas Arco Paragon (new-style), a Pelikan M800, a Visconti Rembrandt, and finally a Sailor 1911 Mid-Size. The Paragon fills using a high-capacity piston system. OMAS has a reputation for sticky pistons which don't work well; but because the new Paragon's piston assembly is made from metal instead of their usual plastic, this pen doesn't have those issues. That being said, it's still not smooth like silk the way Pelikan's pistons are. Ink capacity is advertised at 1.7mL, but I've only been able to get 1.5mL out of it - which is still more than any converter can hold. The ink is Diamine Terracotta. This pen certainly is beautiful; but if it doesn't write well, it fails at accomplishing its main purpose. Thankfully, this pen writes beautifully. 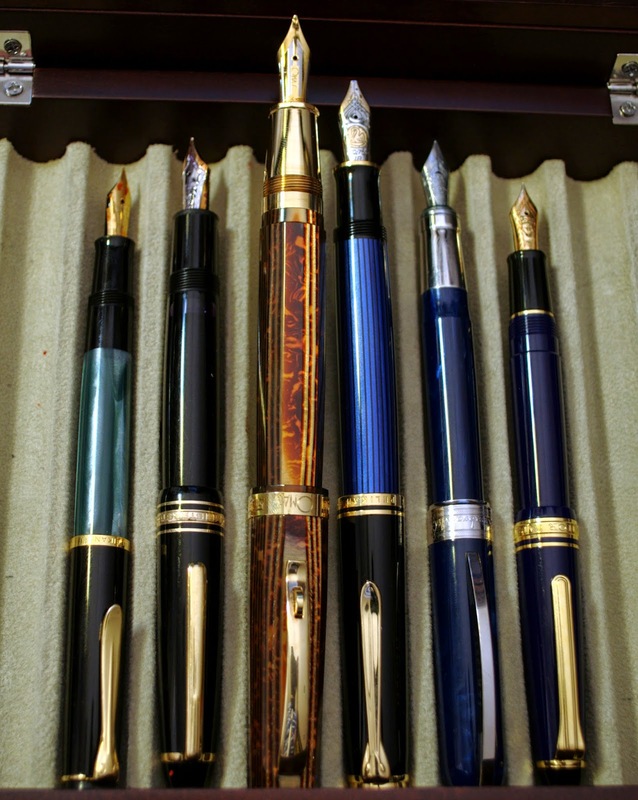 Mine has a broad nib which writes like a firehose thanks to the sizable ebonite feed and, because it's 18 kt gold, also has a bit of springiness. Giving further flair to your writing, there are also some stubbish qualities to the nib: downstrokes are broader than cross strokes. What I've just described may sound like the perfect nib to you, but it's far too broad for me to use for everyday writing. This isn't a fault with the pen; it's just that I don't care for firehose broads as much as I thought I would. I'm already planning to send it to Pendleton Brown to be ground into a nice fine italic which I could use more often. When it comes back, I'll update the review with a new writing sample and more in this section. I decided to fill this Paragon with Diamine 150th Anniversary Terracotta, a red/orange ink with beautiful shading. It's been in the pen since then, and I couldn't be happier: they're a perfect match. The new-style Paragon is certainly an excellent pen. It has all the features I like to see in one: a smooth gold nib, piston filling system, and a beautiful material. Those are all nice, but you have to consider the barrier-to-entry: its price. So, is it worth the $1,000 price tag? I definitely think so.